Always enjoy having a conversation with Deirdre Bolton. Her new show was moved to a new studio and given a prime time slot. I’m dropping in again next Thursday at 5:30pm ET. 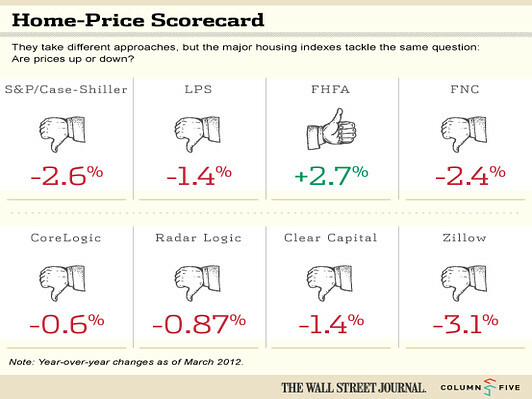 Tonight we spoke about this WSJ piece: Call It a Comeback for Risky Home Buyers. 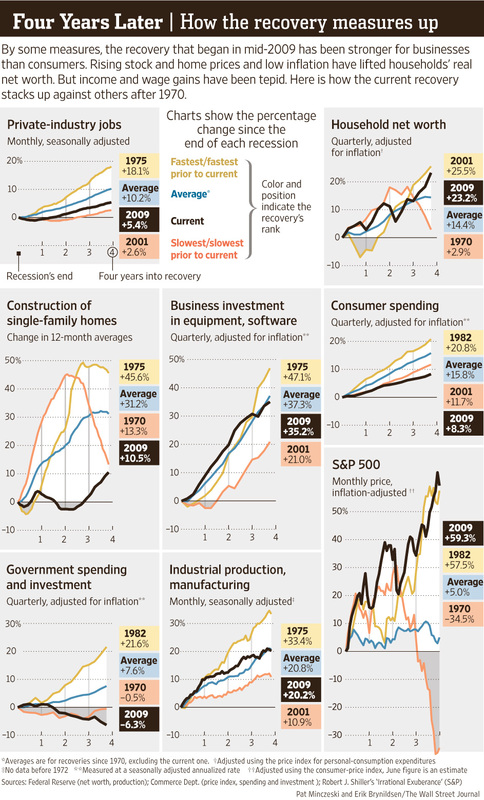 Check out this excellent interactive graphics post at the WSJ on the economy since the recession. My fave is above but there are others worth mentioning. Things are slowly improving but note that in the “consumer” section of the interactive (not above), real wages are unchanged since 2009 (housing prices up 12.1% in past year alone). 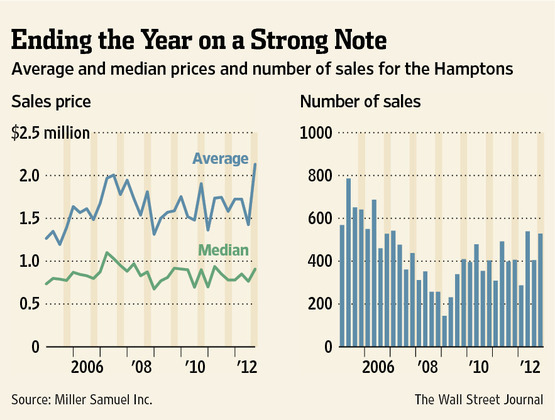 I thought the chart created by the WSJ using our data nicely illustrated the end of year spike in sales and prices at the end of the 2012, influenced by the notion that taxes, whatever form they take, will be higher in the future. I think this surge in activity will take some of the edge off the market in 2013. In this week’s WSJ Mansion section there was a nice write up by Alyssa Abkowitz about the appraisal process during a divorce: Appraisers in Splitsville. Our firm does a lot of this type of consulting and we find working with attorneys much easier than dealing with retail banks. I also find that it’s a small world – I know nearly all the appraisers in my market personally (only a handful are active in this segment). Most are professional and knowledgable but like any profession, there are a few hacks. The challenge in the divorce appraisal business is the challenge of proper communication between the parties – the slightest miscue can snowball into a huge complicated mess billable by the hour. The key to valuation in this process is to filter out the personal element of it and just do the appraisal. When working for one party, the appraiser never gets the whole story and magically “you’re not always on the ‘right’ side so don’t concern yourself with the details beyond the valuation.” Professionals are the ones that do their job devoid of personal bias. Inspired by my analysis of yesterday’s WSJ article, I thought I’d explore the effectiveness of low mortgage rates in getting the housing market going. 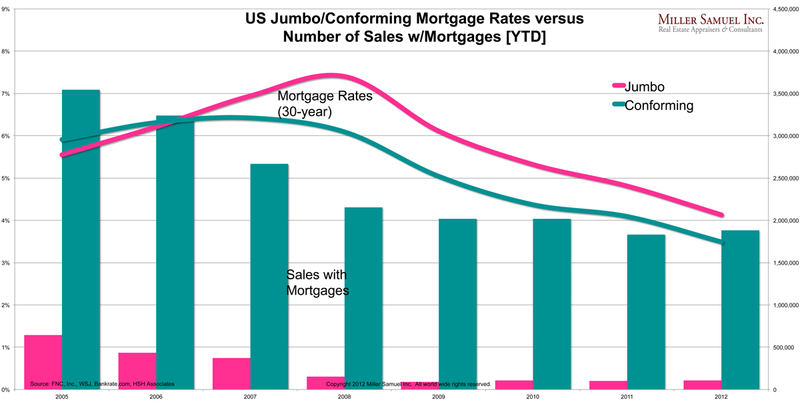 I matched year-to-date sales volume where a mortgage was used and mortgage rates broken out by conforming and jumbo mortgage volume. Mortgage volume has been falling (off an artificial high I might add) since 2005, while rates have continued to fall to new record lows, yet transaction volume has not recovered. I contend that low rates can now do no more to help housing than they already have. Even the NAR has run out of reasons and is now focusing on bad appraisals as holding the market back (I agree appraisal quality post Dodd-Frank is terrible and is impacting the market to a limited extent – and I secretly wish appraiser held that much sway over the market). I’m no bear, but the uptick Case Shiller’s report today (remembering that Case Shiller reflects the housing market 5-7 months ago) still shows slowing momentum and all 2012 year-over-year comparisons in the various national reports are skewed higher from an anemic 2011. 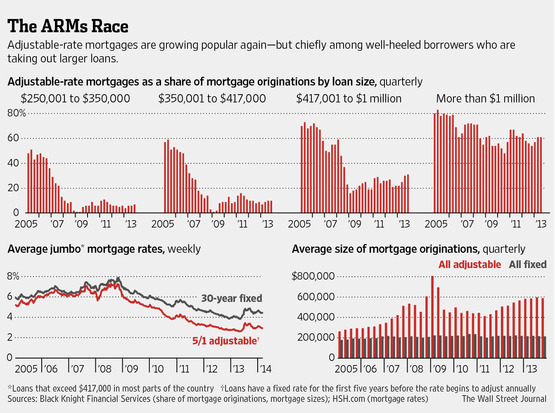 Five years of falling mortgage rates have only served to provide stability in volume. The monetary and fiscal conversation ought to be on ways to incentivize banks to ease credit – falling rates only makes them more risk averse. Of course a significant drop in unemployment would likely solve the tight credit problem fairly quickly. 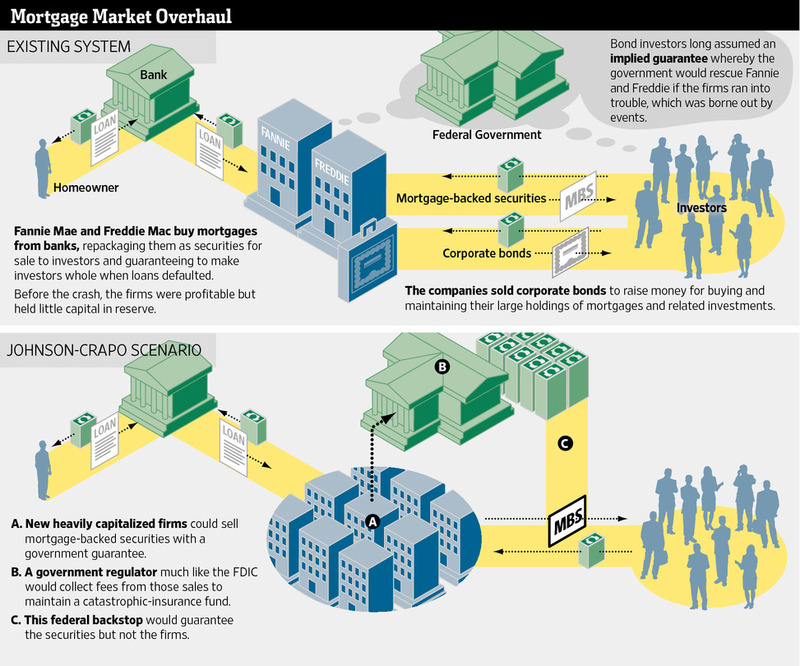 Matthew Strozier over at WSJ with Column Five (a large producer of infographics) presented an interesting side by side of 8 national housing indices. All but one index shows a year over year decline in housing. Trulia’s new Price Monitor by Jed Kolko would be a great addition once the year-over-year history is established. It was also interesting that NAR’s Existing Home Sales was omitted (I’m not advocating). US indices are general in sync on the year-over-year. Our confusion in the monthly barrage of housing metric releases is that most push the month-over month. With the proliferation of these indices, data subscriptions must be getting cheaper. There are a few more out there as well. Of the indices presented, their data collection and methodologies vary significantly (where disclosed) yet their results were consistent perhaps suggesting the 7 for 8 result is coincidence as opposed to an aggregated trend. Sales prices are not something we should be obsessed with as an indicator of market health (think Las Vegas, mid decade). I’d much prefer seeing more attention paid to sales trends since they are a pre-cursor to price trends if you are trying to reasonably answer the question: Has the US housing market hit bottom? It is interesting and my rough understanding that most of these indices were created and run by economists, scientists or data wonks, many for Wall Street purposes with virtually no real estate types. That’s obviously fine until you consider what is said in barrage of monthly press releases for some, citing things that are not empirically measured in their respective reports, i.e. weather, inventory, etc. that create further confusion. I’d love to see a side by side comparison of the lag time from the point of “meeting of the minds” between buyer and seller for each index. The significant lag time reflected in this index genre is a practical one due to the massive scale of information, but I think it would give consumers (who were generally not the intended users of any of these indices at the time they were created) a better sense of reliability for each. National housing indices provide useful tools for setting government economic policy but the consumer’s obsession with the idea of a national housing market and it’s relevance to their local markets is, well, crazy.